As a child I fell in love with the work of Edgar Degas. Unfortunately, works of fine art are a little beyond my budget. Fortunately though the world is filled with many talented commercial artists who make a living selling their art to the bourgeois (like me!). 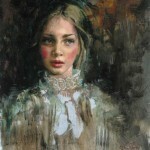 Recently I discovered “Irene Sheri” and have since acquired a few of her oil paintings. Posted in • media and tagged art, irene-sheri on January 12, 2014 by aubadegirl.